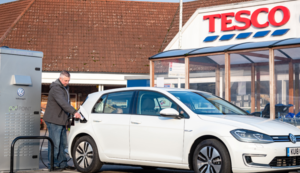 Tesco and Volkswagen are to roll out over 2,400 EV charging bays powered by Pod Point across 600 Tesco stores within the next three years to create the largest UK retail electric vehicle charging network. The charging bays will be based in Tesco Extra and Superstore car parks. Customers will be able to charge their electric cars using a normal 7kW charger for free or a ‘rapid’ 50 kW charger for a small cost in line with market rate. “This agreement represents a 14% increase in the number of public charge bays in the UK and is a monumental day for electric vehicle drivers. It is a massive leap forward for the UK,” said Pod Point CEO Erik Fairbairn.